With so much attention being paid to the ongoing Bajagua controversy, little attention has been paid to the other private corporation, Veolia Water that is under contract to the International Boundary and Water Commission to treat wastewater at the International Wastewater Treatment Plant along the U.S.-Mexico border and maintain sewage diversion structures along the border. When WiLDCOAST embarked on our Clean Water Now! Campaign two years ago, one of the first things I noticed is that pollution that causes beach closures in Imperial Beach and Coronado does not just come from sewage dumped into the Tijuana River in Mexico. U.S. agriculture operators in the Tijuana River Valley contribute to pollution (most notably a sod farm just east of Dairy Mart Road). Some stable owners were illegally dumping animal waste into the river when it rained (and have since been stopped), and Veolia Water the contractor to the IBWC charged with maintaining two diversion structures along the border fence in Goat Canyon and Smuggler’s Gulch was negligent in its duties. The French conglomerate, one of the world’s largest environmental services company was not adequately cleaning out two sewage diversion systems that routinely are filled with sewage. The Veolia Corporation was founded in 1853 in France as Compagnie Génerale des Eaux (CGE). By the time the Vivendi Corporation acquired the company in 1998, CGE was one of the two largest water companies in the world. In 2002, after Vivendi sold its share in CGE, the company was renamed Veolia. The transnational corporation has acquired various businesses in the areas of water, waste management, energy and transportation, which were all branded under the joint name of Veolia in 2005. Veolia Environment states it is the world leader in environmental services with more than 270,000 employees and generating revenue of 25.2 billion in 2005. Jacques Michel in 1990 he started his own consultant firm called Assistance et Contrôle des Service Public (ACSP). Its business was to advise cities on their private water and sewage treatment contracts with a view to getting them a better deal. His intention was to show that cities were being overcharged. In the early 90s, Michel began advising municipalities, Nice, Cannes, St. Tropez, Toulon and the commune of St. Maxime. His study of their water agreements revealed extensive overcharging of as much as 72 per cent. Most of the waterworks in this area were/are controlled by a company called SA Compagnie des Eaux et de l’ozone, an affiliate of Compagnie Geéneralé des Eaux (CGE), later called Vivendi and now Veolia. The regional director was a man named Régis Calmels. Calmels decided in the spring of 1994 that Michel’s activities were becoming prejudicial to his company or, as one witness later said, were “getting in the way.” A fellow water executive, Louis Cunnac referred him to Bernard Cayron, who was the manager of a Paris-based company called la Société Export Trading Services. This company specialized in selling “special equipment” (weapons) to the French ministries of defense, the interior and justice and also offered security services. Cayron, a military veteran, had previously done some contract work for Cunnac and Vivendi that involved surveillance and screening for bugs. In July 1994, arsonists attempted to burn down Michel’s home in Béziers, France. Police charged Cayron and Calmels in 1994 with consorting with criminals intent on committing crimes, to wit, the intimidation and extortion of Michel. Vivendi quickly shipped Calmels off to the Philippines. He is now working in Indonesia for Vivendi. Michel was later sued by Vivendi for libel but won his case. Veolia, by the way, is, according to a story in The San Diego Union-Tribune, one of the companies submitting bids to Bajagua to build and operates its U.S. taxpayer funded sewage treatment plant in Eastern Tijuana. 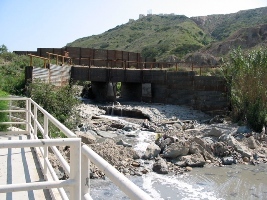 After our complaint to the State Department, I am pleased to say that Veolia Water is now doing a much better job in cleaning up the diversion structures in Goat Canyon and Smuggler’s Gulch.